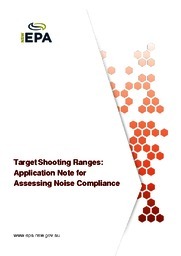 This application note clarifies ways in which the EPA assesses compliance with noise limits at target shooting ranges. The Protection of the Environment Operations (Noise Control) Regulation 2017 specifies the methods that must be used when measuring noise from shooting ranges for the purposes of a requirement under the Protection of the Environment Operations Act 1997. This application note was developed to clarify ways in which the EPA assesses compliance with noise limits at target shooting ranges. The guidance in the application note relating to methods for the measurement of noise from shooting ranges has been superseded by the method set out in the Protection of the Environment Operations (Noise Control) Regulation 2017. The application note remains available as it also contains other useful information used to assess the potential impact of target shooting range noise on nearby residences. The EPA does not set limits based on the level of a single shot because an inaccurate measurement could lead to an incorrect assessment that a range is not compliant. Compliance can be assessed without notifying the range. This is also the case for other regulated activities (PDF 455KB).